Christianity or Islam: which is the real religion of peace? Almost any liberal pundit will tell you that there's a religion bent on destroying our Constitution, stripping us of our liberties, and imposing religious rule on the U.S. And that religion is . . .Christianity! About Islam, however, the Left is silent--except to claim a moral equivalence between the two: if Islam has terrorists today, that's nothing compared to the Crusades, inquisitions, and religious wars in Christianity's past. But is this true? Are conservative Christians really more of a threat to free societies than Islamic jihadists? Is the Bible really just as violent as the Qur'an? Is Christianity's history really as bloodstained as Islam's? In Religion of Peace? 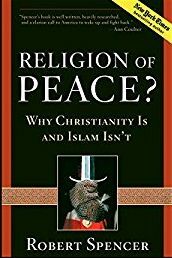 Why Christianity Is and Islam Isn't, New York Times best-selling author Robert Spencer refutes such charges with hard facts and examples of how Christianity helped build America, and how Islam is bent on destroying it.